Technion–Israel Institute of Technology Professor of Chemical Engineering and Nanotechnology, Hossam Haick on being an Arab Nanoscientist in Israel. We have a tradition in the Arab sector that immediately after high school you go to university [unlike most Jews in Israel, who do their military or other national service first], without any experience in life, without any experience with science, or with what is going on in universities. Sometimes this is problematic, so I decided that I would not do it that way. I found work as a waiter. I worked in a fish restaurant for thirteen hours per day . . . and that’s when I started to see that home and school are very nice places! When you work, you interact with people, you start to see the conflicts—not from the news, but rather in reality. Those were the most useful years of my life. Two years later, I started at Ben-Gurion University for chemical-engineering studies, and later took my Ph.D. at the Technion. And then I decided to do a postdoctoral fellowship at the California Institute of Technology. My wife and I spent two years in the United States, and then we faced a dilemma: Should we move back to Israel? We had several offers from leading universities in the United States to join the faculty. In terms of salaries, they could offer more than the universities in Israel, also social benefits, great students—everything was much better. But after a lot of thinking, we realized that if a scientist does not translate his work to society, then he will not deliver the main message expected from a scientist. And we thought that our contribution to society could be much better in Israel, because we know the community here, we know the conflicts between Arabs and Jews, we know the difficulties of the students. . . . So we decided to come back to Israel, to the Technion. The Technion is of course a leading technological institute, and that was the main thing. But the added value is its location in Haifa, where there is a mix of Arab, Jewish, Druze, Russians, everybody. We thought that maybe, under the umbrella of science, we could help to make a kind of network among all these people. Today, about 25 to 30 percent of my time is devoted to going into high schools and communities. When I do this, I am often asked: “How do you feel as an Arab in Israel?” These questions are not necessarily connected to my scientific work but rather to the social part of who I am. And I like to hear them, because I want to answer them. The major thing I want to convey is this: in the Arab society, there is a belief that, as an Arab, you never can succeed in this country. You shouldn’t go for a Ph.D. or graduate studies, because you will not find any place to work. I try to educate the new generations, saying: Try to excel in what you do, in your studies. If you have truly excellent achievements, you won’t need to look for places to work; they will look for you. I travel all over Israel, starting with the Bedouins in the South, up to the North. And I don’t focus my efforts only on Arab schools; every week, I give talks at Jewish schools, too. The Jews need a new role model, too. With the primary school kids and with Arab Ph.D. students—I don’t teach them only about research in science and technology. I let them know they have to contribute to society at the same time. We need to increase the number of role models in our society, otherwise we will not advance anywhere, and the gap between the Arabs and the Jews will get even bigger. I am grateful for every effort that is done to raise the level of the Arab sector, because this helps the whole country. I am trying to change perceptions on both sides. We cannot make changes on one side only. Learn more about Hossam's innovative work to sniff out disease. There are countless stories in Israel of small-scale businesses that cobble together several undertakings in order to succeed. The Rish Lakish olive oil press, in the village of Zippori in the Lower Galilee, is one of these. At the head of this family-owned business are Micha and Rachelle Noymeir, but their six children played a formative role in the establishment of their olive oil production. Their headquarters, a lovely straw-bale structure, was built by the Noymeir sons. During harvest time at Rish Lakish, ladders are propped against trees in the olive groves and workers focus on their task (unlike most commercial olive groves, which use mechanical “shakers” to urge the fruits off the trees, at Rish Lakish, all olives are picked by hand). The tiny green-and-purple fruits then go back to the compound, where the olives are quickly shuttled onto a conveyor belt, sorted from leaves and twigs, and dropped into the press, to be pummeled by a set of massive granite stones. Later, the olive mush is centrifugally churned to separate the oil from the dregs. The end product is a beautifully pristine tawny-green oil, rich and flavorful. While chiefly a producer of organic olive oil, Rish Lakish also sells foodstuffs and olive-oil-based cosmetics, has a fine little café, gives tours of the facility, and invites schoolchildren to visit the olive groves. 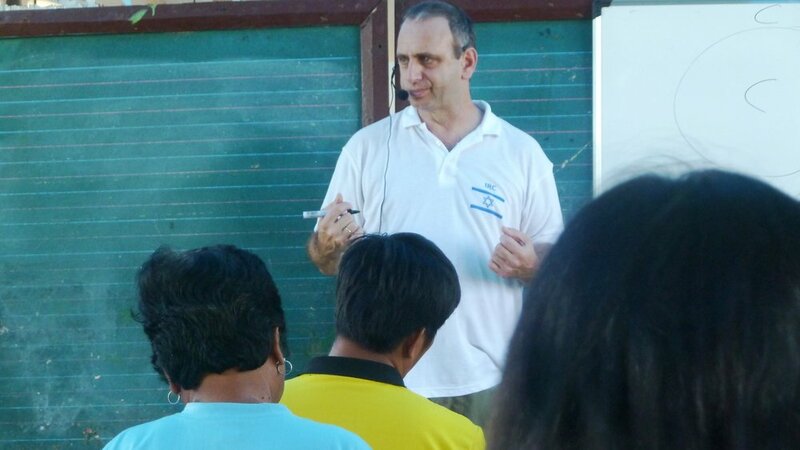 During harvest time, they hire Israeli, Palestinian, and Thai workers, and host international volunteers who come to work on the farm. The operation is involved in a consortium called Olive Oil Without Borders, a project with a goal to bolster grassroots, cross-border economic cooperation and to promote peace and reconciliation between Israeli Jews, Israeli Arabs, and Palestinians. Yeshayahu Talmon is a chemical engineer and former director of the Russell Berrie Nanotechnology Institute (RBNI) at the Technion-Israel Institute of Technology, in Haifa. A frequent spokesman for the industry, he answers even laymen’s questions patiently and lucidly, and offers positive news about Israel as a “nucleus” for nanoscience. Nanotech is all around us and inside us. Our cells are enclosed within membranes that are about five nanometers thick. Nanotechnology can involve either organic or nonorganic materials. Some of our foods have nanoparticles that are organic. Many of our body liquids—blood, for instance—have nanoparticles. Nanoscience is the science of everything that happens on that very small scale. Now, technology is being developed to take that science and apply it. Another example of how the technology is applied is graphene sheets. Graphite, of course, is what you have in your pencil. However, when graphite is dispersed into single layers of carbon atoms, it has mechanical and electrical properties that can be used to make interesting coatings, like for touch screens, for instance. All touch screens now have some kind of conductors in them, and by using graphene, you can potentially make better, cheaper, longer-lasting coatings. In 2010, the Nobel Prize in Physics was given to Andre Geim and Konstantin Novoselov, two scientists working on graphene, so this field suddenly became even more exciting than before. There is also a very important interface between medicine and the nanosciences, starting with intelligent, sophisticated sensors, all the way to drug delivery. At the Technion, we try to bring people from our faculty of medicine together with people from engineering and the basic sciences, in some cases to advise graduate students jointly, and to work on a medical or biological problem where scientists and engineers can help. Collaborations among the various scientific disciplines are crucial here. Israel joined the nano community early on. And the Technion formed the nanotechnology center in 2005, two years before anybody else here. I played a part in its formation, but the effort was primarily led by Professor Uri Sivan of the physics department, who was the first director of the Russell Berrie Nanotechnology Institute. (I took over in 2010.) In a way, it was a pioneering effort not only for the Technion, but for the entire country, because it formed a model on which all the other institutes were formed, not so much in the structure, but much more in the emphasis and in the way they are supported. We have recruited many new faculty members at the RBNI; each of them is excellent. Many of them spent a good number of years in the United States or in other places, but most are originally Israeli. There is a lot of talk about bringing back Israelis from abroad. We’ve had to lure them from places like Boston University, Stanford, UCLA—it’s competitive. And then, when they’ve made the decision to come to Israel, we have to compete with the other Israeli universities: the Weizmann Institute, the Hebrew University, Tel Aviv University, and so on. Our government is trying to reverse the “brain drain” that we have experienced most acutely in the sciences, of course, because these are the people who are most sought-after by institutions outside Israel. But there is a kind of “snowball effect”—although we scientists prefer to call it a “nucleation process”! Once you form a nucleus, it grows and attracts more material to form a crystal. Good researchers are attracted to a good nucleus. Shari Arison is one of the most successful women in the world. Among the entities under her watch are the Shikun and Binui real-estate and infrastructure business, Israel’s Bank Hapoalim, and Miya, the company that optimizes urban water supplies. Shari also heads The Ted Arison Family Foundation, a major philanthropic force in Israel and elsewhere, and she founded Matan, the Israeli counterpart to United Way. She is respected around the world for her eco-awareness and her companies’ devotion to sustainability. Shari’s 2009 book Birth: When the Spiritual and the Material Come Together has been translated into many languages and distributed worldwide. Her unique humanitarian values-based approach in business and philanthropy has earned her an honorary doctorate in humane letters from George Mason University. In 2013 Shari published Activate Your Goodness: Transforming the World through Doing Good, in which she outlines basic strategies for daily decency and her own insights into ethics. She has expanded on that notion with her latest volume: The Doing Good Model: Activate Your Goodness in Business, in which she illustrates how everyone benefits when companies value people and the planet alongside profits. Israel has an Arab population of about 20 percent: currently that is some 1.7 million people. Yet the percentage of Israeli Arabs involved in the booming field of high tech is far lower—only about 2 percent of Israeli technology workers are Arab. This gap is one of the many challenges in the country today—but it is beginning to lessen, bit by bit. Arabs are represented at Israel’s top universities in numbers that correspond more closely with their percentage in the overall population. And the numbers of Arab engineers at the large Israeli branches of multinational tech companies such as Cisco, Google, Intel, and Microsoft are starting to climb. In the city of Nazareth, a small startup ecosystem is coming to life, with the help of Arab-focused venture capital funds and undertakings like the Nazareth Business Incubator Center and Stef Wertheimer’s industrial park. Alpha Omega is one of the Arab-directed companies with headquarters at Wertheimer’s Nazareth park. Founded in 1993 by Reem Younis and her husband, Imad, the company produces cutting-edge products for neurosurgery and neuroscience research. They make a device that functions like a “GPS” system for the brain—recording neural activity, stimulating neural tissue, processing and analyzing data. It is used by neurosurgeons in the treatment patients with a variety of disorders, such as Parkinson’s disease and dystonia (a syndrome that causes involuntary muscle spasms). We didn’t begin with an idea to “start a startup”; our only idea was to bring high tech to Nazareth, to the Arab sector, the Arab community. And we called it “Alpha Omega” because the idea was—we’ll do everything, from A to Z. Little by little we went into the medical-equipment business. We are there in the operating room with doctors treating people with neurological and mental disorders, helping them to get better. Alpha Omega’s “GPS systems for neurosurgeons” are used in hundreds of research labs and hospitals around the world. The Younises are proud to say that several of their former employees have gone on to form companies of their own. Most recently, Alpha Omega has released a new product that supports both clinical and research functions. And after securing regulatory approval in China, Alpha Omega has made its first major step into the Asian market. Reem and Imad Younis are modeling and promoting entrepreneurship among the next generation of Israeli Arabs, encouraging them to take hold of the future and do something great with it. Naty Barak, Chief of Sustainability at the pioneering company Netafim describes Israel’s role in launching an irrigation technology that has revolutionized agriculture around the world. In Hebrew, we say that we’re talking to farmers ‘at eye level’: farmer to farmer. When I was young, I was very idealistic. I moved from my home in Haifa to Kibbutz Hatzerim in 1964, along with a group of other young people. We were all farmers, but we weren’t having much success because of water shortage and the high salinity of the soil. The idea for Netafim came in 1965. We had been looking for an industry as a focal point, and we’d set up some guidelines for what we wanted. For one thing, we wanted it to be connected to agriculture. We needed something that would not require too much labor: the idea was to find work for fourteen kibbutz members. (Today we have nearly three thousand employees, all over the world. It was Simcha Blass who moved the idea of drip irrigation forward. Once, Simcha saw a long row of trees that had obviously all been planted at the same time—and yet one of them was far bigger than the others. He was curious and went to see what the reason was. He discovered a water pipe that had a crack in it, and it was leaking near the tree, slowly, drop by drop. On the surface of the ground, there was just a limited circle that was a little bit wet, and the rest of the soil was dry. When he started digging, he saw that underground the wet area became wider, and that there were a lot of roots. This gave him the idea. That was in the late 1930s. But he kept the idea in his head for years, until affordable plastic piping was introduced, and in the 1960s he started to do experiments in his backyard with the drip system. A few years later, a brilliant engineer developed the next generation of drippers for us. Today, the tiny plastic dripper has many functions built into it. It’s pressure-compensated, which means that it will always deliver exactly the same amount of water, regardless of distance from the water source; it’s self-cleaning; and it has all kinds of clog-prevention and non-leakage mechanisms. To give you an idea of what it all means: I’ve worked a lot in the Arava Desert. The rainfall there can sometimes be as little as twenty millimeters per year. But today it’s a rich agricultural area, largely because of drip irrigation. Today, Netafim has thirteen manufacturing plants all over the world: in California, Mexico, Chile, Brazil, South Africa, Australia, two plants in India (and we are thinking about a third one), three plants in Israel, one in Turkey—and so on. Wherever you have agriculture, you have drip irrigation. It helps in growing tea in Tanzania, sugarcane in the Philippines, potatoes in China, etcetera. We’re involved—along with several other irrigation companies—in the Andhra Pradesh Micro Irrigation Project in India, helping farmers to enhance their crop yield and save water. We also donated drip-irrigation systems to a foundation in Oklahoma, and they in turn gave them to a military base in Afghanistan; now they are bringing Afghan farmers into the base to teach them how to use drip irrigation. On a smaller scale, we have developed what we call the “Family Drip System” for small farmers in developing countries. It’s gravity-based, so you don’t need electricity. All you need is to put a tank on an elevated stage, fill it with water, mix it with the right nutrients, open the valve and shut the valve—and it will irrigate five hundred square meters, which is a small farm for a family. Training is very important, of course. But if the farmers do it right, the increased yield is amazing, and the return on investment is in less than one year. We’ve distributed these in Kenya and elsewhere. In reaching out to farmers in other places, we try to work collaboratively. We don’t say: “We came from Mount Sinai. We invented drip irrigation; do what we tell you and you’ll be successful.” That’s the wrong attitude. We say: “Listen, you have been growing tomatoes in this region for generations—you and your father and your grandfather—so you must know a lot about growing tomatoes. We know something about drip irrigation; we are working in the Arava with tomato growers . . . so let’s bring our skills together.” And whether we are talking to a Chinese farmer who has one tiny parcel of land, or a cotton-farm manager in Arizona who wears $2,000 lizard-skin boots, we talk to both of them the same way. We give them the same respect. In Hebrew, we say that we’re talking to farmers “at eye level”: farmer to farmer. Founded in 1997 by educators Amin Khalaf and Lee Gordon, Hand in Hand: The Center for Jewish-Arab Education in Israel started with the basic observation that Jewish and Arab citizens of Israel operate separately in virtually all aspects of life, and that this separation is especially notable (and influential) in the country’s K–12 public-education system. Khalaf and Gordon wanted to start a school that would bridge that separation. Hand in Hand’s curriculum is bilingual—Hebrew and Arabic—with two teachers in every classroom, and English is taught beginning in third grade. As of this writing, there are six campuses around the country, where more than 1,300 students are educated every year. Over the coming decade, administrators hope to build ten to fifteen more Hand in Hand schools throughout the country. Though funding is never easy—not everyone believes that such schools should exist—Hand in Hand does receive some support from the state, supplemented with tuition and backing from individual donors, private philanthropies like the Jerusalem Foundation, and the U.S. government (which in 2012 gave Hand in Hand a million-dollar grant to help launch three new campuses). Hand in Hand’s K–12 school in Jerusalem is located in the southern part of the city, between the Arab community of Beit Safafa and the Jewish neighborhood of Patt. Its campus is made up of handsome stone buildings, with halls hung with colorful murals of handprints, as well as paintings and photographs by students.